At our medical and dental centre in Dainfern - we also boast a full travel clinic so before your trip consider popping past and get the destination specific vaccinations you need! Mediwell Medical and Dental Centre is the best travel clinic Fourways has to offer because it is run by highly experienced, trusted and caring healthcare professionals who are able to assist you with any of your needs. Every destination’s vaccination requirements are different, as diseases are often destination specific – but all are preventable through vaccinations. We do our best to equip you with the most up-to-date vaccinations as possible. We take appointments but you can also visit our travel vaccines clinic at any time – for your convenience, we are open 7 days a week! Our advice is tailored to your personal health circumstances and the specific destinations you will be visiting. Our travel clinic in Fourways offers a wide range of health services. Travel Health Assessments and advice on your planned travel to specific destinations. Travel medicine for pregnancy or chronic medical conditions. Travel vaccinations required by the countries you are visiting. 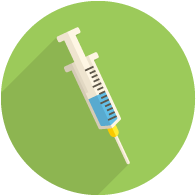 Vaccinations Assessments and recommendations in relation to your personal health circumstances. Travel first aid kits, insect repellents and medication for commonly experienced conditions such as diarrhoea. Contact Our Fourways Travel Clinic or Book an appointment today. Being open 7 days a week and also being conveniently located in the Dainfern shopping centre – makes us the most accessible travel clinic Fourways has to offer. Not only are we easily accessible – but as mentioned above we offer a wide variety of treatments and are able to administer all of your required and recommended travel vaccinations. Our travel medicine covers the full spectrum of travel health services.. Our practioners are the best of the bests and will help you reduce your health risks, giving you the extra peace of mind during your travel abroad. Contact us to book an appointment today.